Supra makes cables and accessories associated with cables. 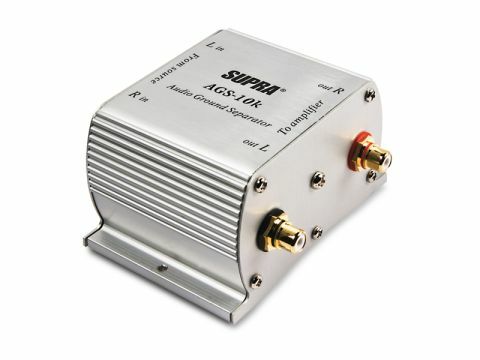 The Supracables AGS-10k audio transformer is, perhaps, rather more than a mere accessory, but it's something that is designed to sit in the cabling between two items – specifically a desktop computer and a hi-fi. It is, in fact, nothing more or less than a pair of one-to-one audio transformers in a metal box a few millimetres in each dimension, with phono sockets on each end. Its purpose in life is summed up by Supra's nickname for it, the 'HumBuster'. A problem frequently encountered when connecting mains-powered computers to hi-fi systems is that both are earthed for safety reasons and this causes background hum at a level high enough to be annoying. This nifty component breaks the hum loop by isolating input from output – there is no direct connection along either the 'hot' or the ground leg of the signal path and, as a result, there can be no hum loop. One has to be a bit careful with this approach, as in some situations audio transformers can themselves be very sensitive to hum, but these are toroidal transformers, magnetically screened, and operated at relatively high signal levels: they do in fact seem remarkably resistant to hum pickup. And indeed they perform exactly as advertised, making a previously unusable connection between computer and hi-fi not only acceptable but gratifyingly clear and detailed. The sound isn't completely unaltered and under very critical conditions we heard a trace of coloration and congestion, as well as some mild distortion, but in terms of getting good sound out of a computer with a basically decent sound card, this is a neat solution.